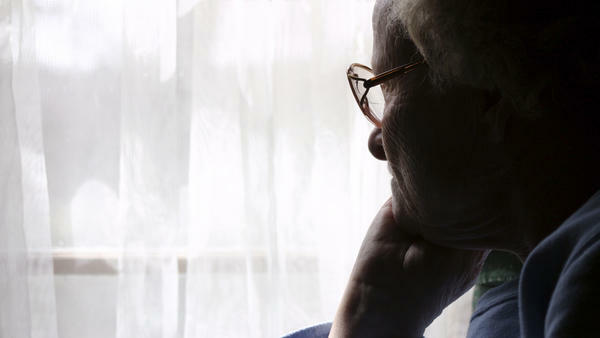 Depression is common among old people, affecting up to 25 percent. Brain researcher Meryl Butters with the University of Pittsburgh School Of Medicine has spent years trying to answer this question. She asks, "What is it about a mood disorder that is relatively treatable, that people can recover from; what is it in the brain that may increase one's risk for dementia many years later?" Dementia can be caused by different diseases, including Alzheimer's disease and vascular dementia, which follows a stroke or series of mini strokes. In a recent study, Butters found that the risk for both of those types of dementia nearly doubled among people who had suffered depression after the age of 50. There are some clues as to why that may be. Depression is associated with inflammation in the body, and inflammation also appears to play a role in cardiovascular disease. Scientists are trying to figure out if the inflammation in the two disorders is linked. The thickening of blood vessel walls in atherosclerosis makes it "difficult for blood to get through to nourish the brain and give the brain all the oxygen that it needs," Butters says, and a less nourished brain might mean greater vulnerability to dementia. Even if this theory doesn't hold up, she says, there's no harm in doing for your brain what you do for your heart: maintain a normal weight, eat a healthy diet and exercise regularly. Butters suggests another clue that may link depression to dementia. It involves the stress hormone cortisol. When people get depressed, they produce excess amounts of cortisol. Butters says that could be problematic for a part of the brain called the hippocampus. "It just so happens that the hippocampus has lots of cortisol receptors," Butters says. "So it may be that if you have high levels of cortisol circulating for long periods of time, they can sort of burn out, for lack of a better term, and die and then the hippocampus shrinks." The hippocampus is responsible for learning and short-term memory. In early-stage dementia, the hippocampus is one of the first regions of the brain to show symptoms. People often forget things that just happened, like what they ate for breakfast or what they just said to someone. One study found that women who had a long history of depression had a smaller hippocampus compared to women of the same age who didn't. But researchers have yet to prove that the brain changes seen in depression contribute to dementia later on. Dr. Charles Reynolds, a geriatric psychiatrist at the University of Pittsburgh Medical Center, says preventing depression could be an important defense against dementia. "I think the good news is that we can help older people and their family caregivers take steps to protect themselves from becoming clinically depressed", he says. If successful, that might ultimately help delay or prevent dementia. Reynolds recently looked at ways to help older adults prevent depression. In his study, counselors visited people in their homes, looking for problems that could lead to depression including difficulty sleeping, lack of exercise, poor nutrition and social isolation. Each participant met with a counselor for six to eight sessions; the counselor helped people tackle these problems themselves. As a result, the grim predictions that one in four older adults would suffer major depression just didn't pan out for this group. "Over a period of two years, incidence was reduced to about 8 or 9 percent," says Dr. Reynolds. That's down by two-thirds. This was true for both black and white older adults, as well as those with low and moderate incomes. So now the next step is for researchers to determine whether lowering rates of depression among middle aged and older people can also protect them against dementia. Depression can have physical consequences. Research now suggests that people who get depressed in middle-age and later, are more likely to develop dementia in old age. NPR Patti Neighmond reports that researchers are trying to understand why that occurs and what can be done about it. PATTI NEIGHMOND, BYLINE: The link between depression and dementia is really something of a mystery. Meryl Butters is a brain researcher whose work has focused on answering this question. MERYL BUTTERS: What is it about a mood disorder that is relatively treatable - that people recover from - what is it about a mood disorder in the brain that may increase one's risk for dementia many years later? NEIGHMOND: Dementia can be caused by either the plaques and tangles that clog up the brain in Alzheimer's disease - or by a series of mini strokes that impair the brain in vascular dementia. In a recent study at the University of Pittsburgh School of Medicine, Butters found the risk for both types of dementia nearly doubled among people who had suffered depression after the age of 50. She says there are some clues about why that may be. For one, the mechanism that causes arteries to harden elsewhere in the body also plays a role in the brain. BUTTERS: So depression is associated with inflammation in the body which can thicken blood vessels, making it difficult for blood to get through and nourish the brain and give the brain all the oxygen that it needs. NEIGHMOND: And a less nourished brain may mean greater vulnerability to dementia. Even if this theory doesn't hold up, Butters says there's no harm in doing for your brain what you do for your heart: Maintain a normal weight, eat a healthy diet, and exercise regularly. Another clue, she says, that may link depression to dementia involves the stress hormone, cortisol. Butters says when people get depressed, they produce excess amounts of cortisol. That could be problematic for a part of the brain called the hippocampus. BUTTERS: And it just so happens that the hippocampus has lots of cortisol receptors. So, it may be that if you have high levels of cortisol circulating for long periods of time, you can, sort of, burn out these receptors and they die and then the hippocampus shrinks. NEIGHMOND: While the hippocampus shrinks with normal aging, Butters points to a study that found it was even smaller in middle aged women who had a history of depression compared to those who didn't. And as it turns out, it's one of the first regions of the brain to show symptoms of dementia. It's responsible for short term memory and people often forget things that just happened, like what they ate for breakfast, or what they just said to someone. Dr. Charles Reynolds is a geriatric psychiatrist at the University of Pittsburgh Medical Center. He says preventing depression could be an important defense against dementia. DR. CHARLES REYNOLDS: I think the good news is we can help older people and their family caregivers take steps to protect themselves from becoming clinically depressed. NEIGHMOND: Reynolds recently looked at ways to help older adults prevent depression. In his study, counselors visited people in their homes, looking for problems that could lead to depression. Things like difficulty sleeping, lack of exercise, poor nutrition, feeling alone. Counselors helped the older individuals tackle these problems themselves. And, in the end, the grim predictions that one in four older adults would suffer major depression just didn't pan out for this group. Over a period of two years, the incidence was reduced to about eight or nine percent. That's down by two thirds. So now the next step is for researchers to determine whether lowering rates of depression among middle aged and older individuals can also protect them against dementia.